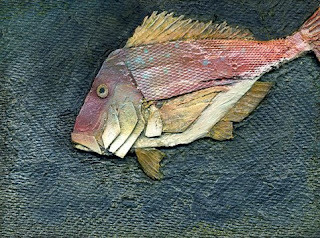 Jim's Snapper was made from 100% recycled material. This one was a prototype for a piece with a school of three that sold at Mairangi Bay's Recycled Art Exhibition this month. He's taking me out for a Snapper dinner with his earnings. He'll be eating a side salad and nibbling off my plate.